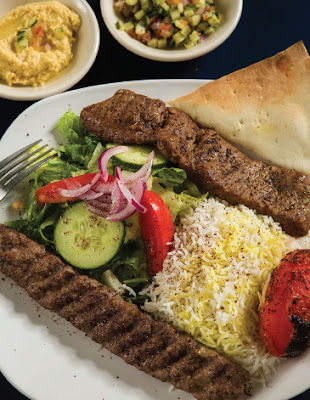 Chef-owner Michael Nader, a native of Iran, serves up simple yet superb Persian cuisine at his restaurant located near the RDU Airport. Tender kebabs grilled over an open flame are the star attraction here. Filet mignon, cage-free chicken and ground chuck all shine, but nothing emerges brighter than the succulent lamb. The key ingredient is olive oil along with the piquant spice, sumac. Nader’s fiancé, Mexican-born Betti Villa, oversees the dining room. She also has added a few extras to the menu, such as special drinks made with fresh fruit and honey. The eatery possesses a warm, cozy ambiance with casual elegance. Walls are festooned with pictures of various mustached figures, from sports legends to famous actors. Weekday specials are available for around $8 at lunchtime.